TSPSC Prohibition & Excise Constable Results 2016-17 along with Cut Off Marks, Merit List available at tspsc.gov.in, Telangana Abkari Constable Exam Result 2016-17. TSPSC Excise Constable Physical Efficiency Test PET and PQT Preliminary Qualify Test Events Test Running Test Long Jump Heigh Jump Short put Events Date Exam Date Results Notification 2016 Hall tickets Download Complete Details TSPSC Excise Constable Physical Efficiency Test PET and PQT Events. After successful completion of Abkari Constable Exam on 31st July 2016. The candidates who have participated in written test are recommended to look at its official website www.tspsc.gov.in in order to get the latest information regarding the final result declaration status. The final date of Constable Exam Result will be released after events. A huge number of contenders are searching the Telangana PSC Prohibition Constable Merit List to check whether they are selected or not. TSPSC Excise Police exam results,TSPSC Constable cut off marks and score card direct links are provided in this page. 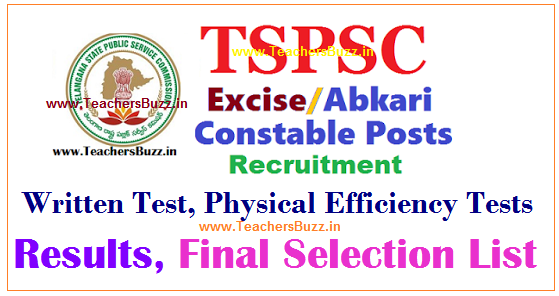 TSPSC Prohibition & Excise Constable In Excise Department,TSPSC Excise/Abkari Police Constable Posts Recruitment Notification Released by Telangana State Public Service Commission for filling up 340 Excise/Abkari Police Constable Posts Posts in Department of Excise. Applications are invited Online from qualified candidates through TSPSC webportal www.tspsc.gov.in to the post of Constable Posts in Department of Excise in the State of Telangana from Dt. 04/05/2016 to 30/05/2016 written Examination conducted on 31-07-2016 and results released on Date: 24/12/2016. TSPSC Excise Constable Physical Efficiency Test PET and PQT Preliminary Qualify Test Events Test Running Test Long Jump High Jump Short put Events are in conducting now after completion of Events the final Results will be released. 2) Preliminary Qualifying Test (PQT):- Candidates must qualify in the Preliminary Selection Test of 4Km. run within 20 minutes for Men and 2Km. run within 20 minutes for women. Telangana State Public Service Commission (TSPSC) has declared Physical Efficiency Test (PET) for the post of Prohibition & Excise Constable in Excise Department of Advt No. 06/ 2016. Selected candidates have to attend for Physical Efficiency Test (PET) on 24, 25, 26, 27, 29-04-2017. TSPSC Prohibition & Excise Constable In Excise Dept Noti.No.06/2016 It is hereby informed that the candidates whose Registered Nos. are given below are provisionally admitted for PET. The candidates are directed to attend for PET at Excise Academy of the state of telangana near Are Masaimma Temple (kali mandhir) Himaith Sagar Road, Bandlaguda Hyderabad at 5.00 AM sharp. Landmarks: Langer House to Chevella road, (2KM Are Maisamma road (LEFT TURN), Beside Don bosco Post Office. Further it is informed that the candidates must produce Hall ticket along with Original Aadhar card, and PQT conformation stamp which is given on the day of PQT and any other Original valid identification card (Voter ID or Driving License etc ) for verification of Candidates. The candidates are further informed that request for Postponement of PET will not be entertained . Commission has successfully conducted Excise Constable Exam on 31st July 2016 (Sunday) at various examination centers at Adilabad, Karimnagar, Warangal, Khammam, Hyderabad, Ranga Reddy, Nizamabad, Mahaboobnagar, Medak, and Nalgonda. Candidates who are searching score card advised that stay calm for further announcement. Right now, events are in progress. Telangana State Abkari Constable Final Results release date, Telangana Excise Constable cut off marks, final results selected list are available at official site tspsc.gov.in Whenever the final result will available on the primary web portal then we will update direct link over here.